Scanning documents and making the conversion to a paperless office offers many advantages—namely, the ability to get rid of space-consuming hard-copy records. When documents are scanned and added to electronic document management systems, the original copies become no longer necessary. These leftovers typically need to be shredded for the sake of security, as keeping an extra copy only doubles its chances for being compromised, however this doesn’t mean there aren’t some documents that shouldn’t be scanned in the first place. In some cases due to legal requirements, and in others just as a good rule-of-thumb, some documents need to be kept as original hard-copies, so when it comes to your company, which categories do your various document fall into? Making the shift to electronic document management systems and a digital workflow comes with many benefits. Primarily it’s praised for its improvements to work efficiency, however there are also cost-efficiency advantages that come with not needing office space or an off site service to store paper documents—leaving extra room and resources for a revenue-driving employee instead. 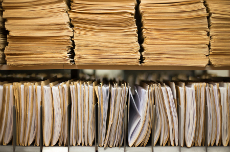 Despite this however, not all documents are created equal, and while some files are ideal for paperless document management, one question many businesses and individuals often ask is whether there are some documents you do need to keep as a hard-copy. It’s a question that usually brings a range of answers—oftentimes being based on what documents people tend to think need holding on to, however there is usually a difference between what we think is required, and what the law actually states as required. To clarify the matter, while some financial advisors for instance still advise clients that documents like tax returns will only be accepted in paper format, agencies like the IRS allow for recordkeeping via electronic storage (IRS Rev. Proc. 97–22). In fact, even if the documents are filed as paper documents, the IRS themselves scans and electronically stores individual taxpayer’s files. Wills – Many states require original paper copies of wills to be filed and retained to provide proof of the individual’s intention for distributing assets. Promissory Notes – Canceling a financial agreement like a mortgage typically requires the use of the original promissory note, much like a will. Titles or Deeds – While not legally required, these documents contain sensitive information that’s infrequently referenced and doesn’t benefit by the accessibility of electronic document management. Tax Returns – The IRS stores paper tax returns as digital documents, as many people now file returns electronically. If audited, necessary documents can be retrieved more quickly via an electronic system. Documents for Court Proceedings – There are rarely objections to using a copy of original documents, because if altered in any way it’s easily-discoverable fraud and leads to sanctions such as the lawyer being disbarred. All Other Client Documents – Unless it falls into a category mentioned above where it’s required or highly recommended to maintain original paper records, documents like medical records can be scanned into an electronic document management system and old paper copies can be discarded. While documents like wills or promissory notes need to be held on to, electronic document management is nevertheless still a growing business trend because it makes daily work both easier and more efficient. In fact, many agencies and industries not only allow using electronic documents—they now actually encourage their use. With recognizing the fact that many modern businesses use electronic document management systems, this means businesses scanning these documents need a plan for what to do with the leftover hard-copies. Businesses obviously still have a responsibility to preserve sensitive client and customer information—regardless of its format and how it’s stored—which means with a digital copy now made and safely stored in an electronic system, the old paper copy should be securely shredded. One of the best ways to do this is implementing a shred-all policy for any documents scanned into the system. 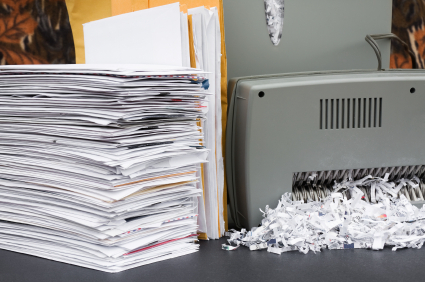 Shred-all policies are easy to follow for all employees, as once a document is copied to digital format, it’s immediately shredded—in turn minimizing chances for a data breach. There’s little chance for this to lead to trouble, as sensitive documents like wills won’t be entering the scanning and destruction process from the get-go—helping employees to easily identify what documents need shredding and what needs keeping. Similarly, a company’s day-forward scanning processes creates a constant stream of old paper copies, making a shred-all policy a perfect fit to go hand-in-hand with the ongoing process as well. 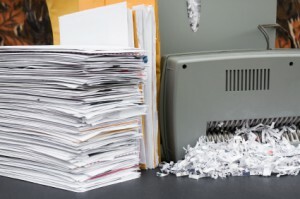 Electronic document management systems are a great way to boost your work efficiency while still maintaining a secure storage system for company documents, but it’s important for you to be sure you’re sticking to the best practices for properly keeping or shredding your hard-copies as well. At Record Nations, we partner with a nationwide network of scanning, shredding, and electronic document management providers—helping to connect your business with the necessary services to ensure you have all your security and legal bases covered. To get started to comparing personalized bids for your project or to learn more about any of our available services, just give us a call at (866) 385-3706 or fill out the form at the right to get free quotes on records shredding, scanning, and storage from providers in your area.